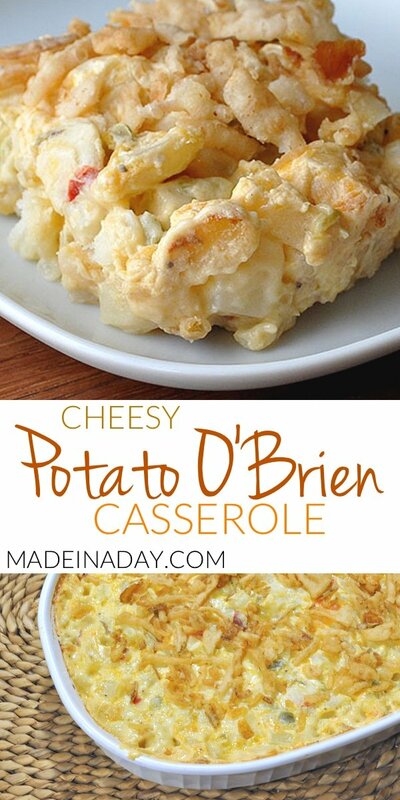 I am so happy to share one of my families favorite side dishes, OBrien Potato Casserole! 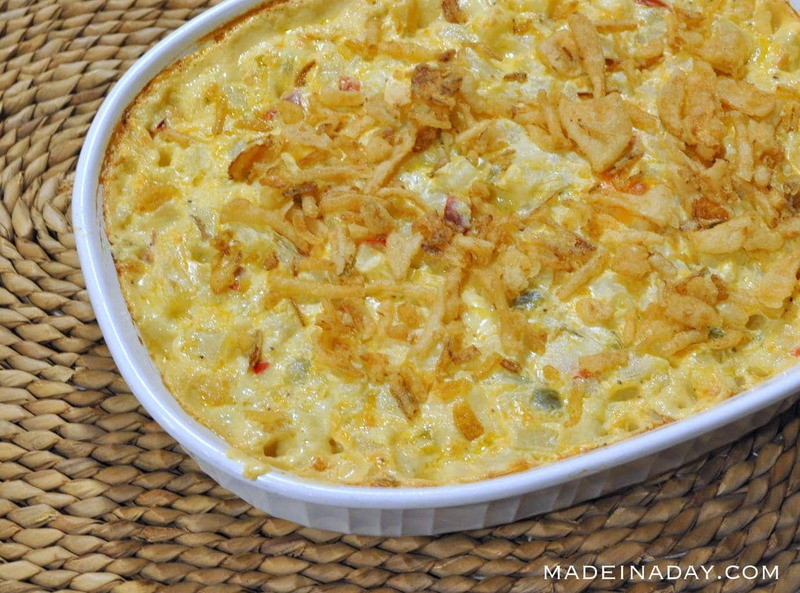 Yummy cheesy potatoes with peppers and onions then topped with french fried onions! 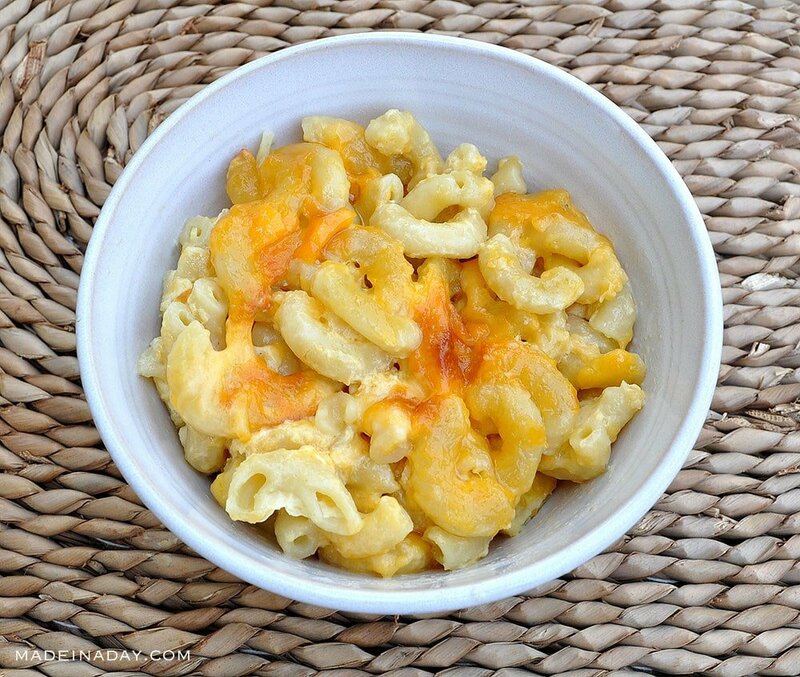 Find more recipes like this on my Side Dishes recipe page. 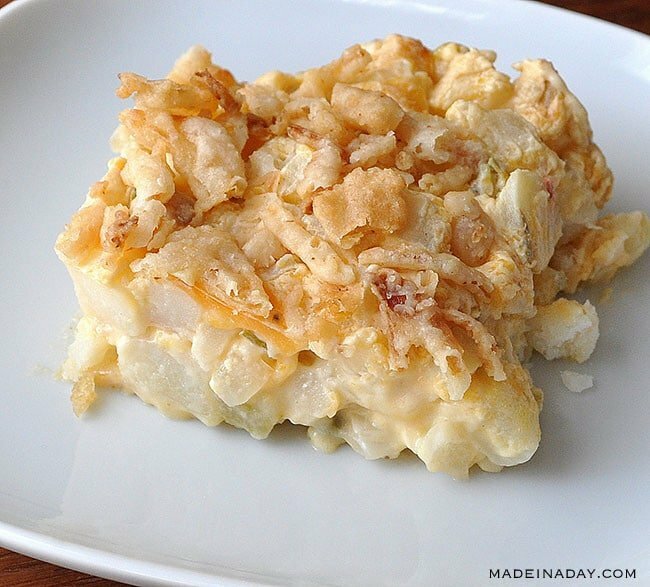 This recipe is one of my families favorite comfort food casseroles. The zesty taste of peppers onions and cheese blend so well we just can’t get enough of it. In our house there usually aren’t any leftovers to spare. 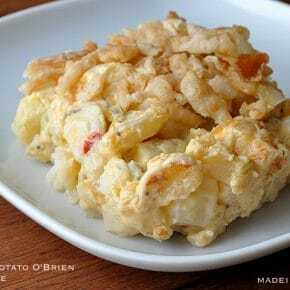 This dish is great for brunch as a hash brown casserole as well as a dinner potato side staple. There are a ton of versions of this casserole out there, here is my version! Adult & kid approved!! 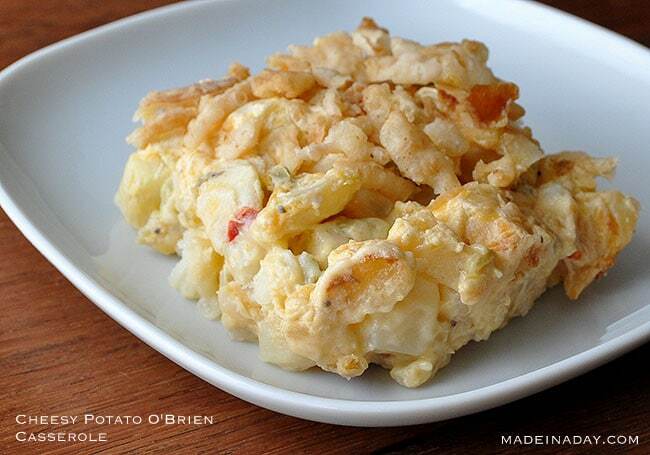 Obrien potatoes and cheese casserole. Place potatoes in a large bowl, cover and microwave for 8 minutes to thaw. Pour mixture into a 2 qt. casserole dish. Remove from oven, top with onions and bake for 5 more minutes. This is my 5th time making this dish. My kids/teenagers liked it so much I now have to make a double batch if my husband and I want some. Taking it to a potluck tonight I know they will love it too! That’s so great that you love this recipe! It is one of our family favs too! Thanks for reading! I am always down for a delicious potato dish! 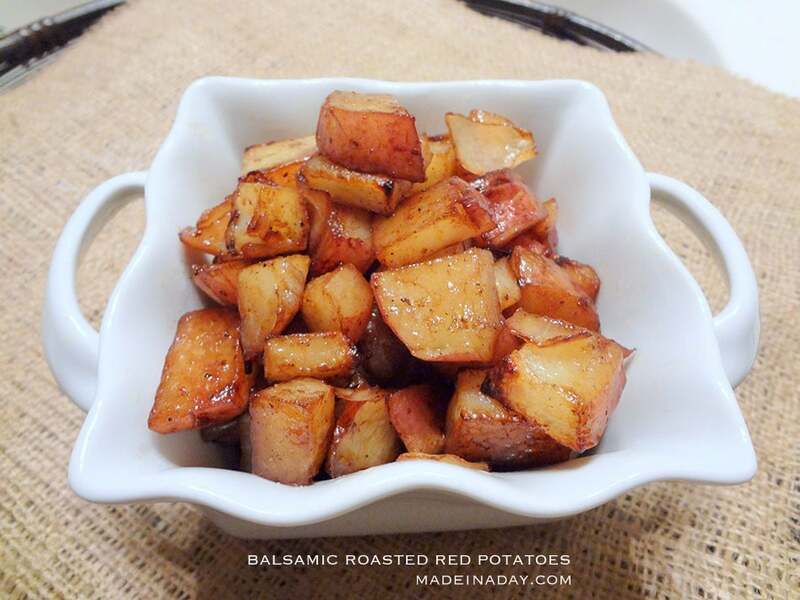 These are the perfect side dish to bring to a pitch-in or holiday party. Thanks for the awesome recipe! Pinning! Visiting from Merry Monday and Pinning! I make a recipe that is very similar with just a couple different ingredients. I like the idea of using cream of celery soup. Following you on FB and Pinterest! Hi Kristin, Thanks so much for following! I followed ya back. I know this recipe can be made a few different ways. I hope you will try my version. It’s our favorite. Thanks for stopping by the party. How big is the bag of potatoes? 24 oz? That’s what I’m using. Hope it works! They look delicious. Yes the bag is 24-28oz of frozen O’brien Potatoes with peppers & onions. I may need to make some today too! Thanks! They turned out great! I had to make them in the crockpot because I wanted them ready to go when we got home from church this morning. Fantastic with ham and asparagus. Hi, Kim ~ Yum!! This sounds delicious! Can’t wait to give it a try. Thanks for sharing! How long and what temp in the crock pot? Candice, I have not made this in a crockpot, this recipe is for baking in an oven. I do not know how long or what temp it would do well in a crockpot. This looks really tasty!! thanks so much for stopping by! !